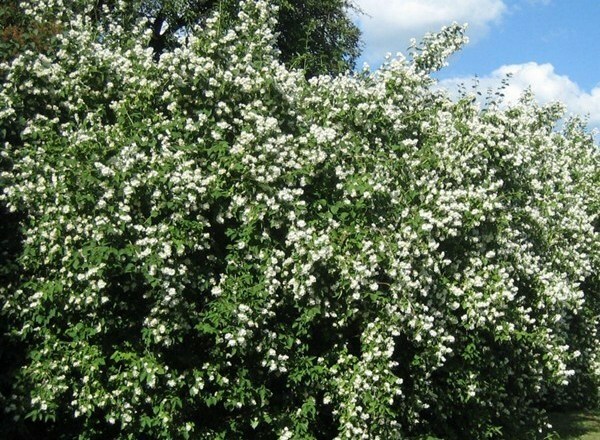 A large deciduous shrub with masses of fragrant double white flowers in June and July. Tolerant of any soil and sunny or shady sites it will make a wonderful informal hedge. Mock Orange Double White or to give it its Latin name Philadelphus Virginal is a large deciduous ornamental shrub from the Holarctic genus of plants native to North and Central America parts of Asia and south-east Europe. The mass of wonderfully fragrant double white flowers in June and July are where the term Mock Orange has evolved from since in the wild the flowers resemble those on citrus trees and have a perfume of orange flowers and Jasmine. The name Philadelphus originates from an ancient Greek king of Egypt. A popular shrub, Mock Orange Double White is often to be found growing in parks or domestic gardens as it can be relied upon to produce an abundance of scented flowers complementing the pretty dark green foliage in the later months of spring and will grow in any reasonable soil in sun or shade. As a tough and hardy shrub Philadelphus Virginal is ideal as an ornamental specimen in any garden as a back of border shrub or it can be grown as a large informal hedge between 180-240cm in height where the full impact of the fragrance can be appreciated. A recommendation of 2-3 plants per metre would normal for hedge planting and growth rate generally between 30-50 cm per year. Trimming should take place after flowering taking back to a strong bud and removing older stems. As a bare root plant, Mock Orange Double White can only be supplied when it is dormant between the months of November and April depending on weather conditions. Bare root plants are a more economical method of planting since care is not so labour intensive as pot grown plants and so therefore are more cost effective. Should you have any queries on bare root plants such as Philadelphus Virginal please phone one of our team and we will endeavour to answer any questions you may have.